UpToDate is a point-of-care resource for health information. The content is written, reviewed, and updated by expert physicians and provide specific recommendations for patient care. This is available to all Goshen College community members with a current GC login. Are you renewing your UpToDate subscription? Skip to these instructions. Go to UpToDate via the Good Library website. You will be prompted to sign-in with your GC username and password. 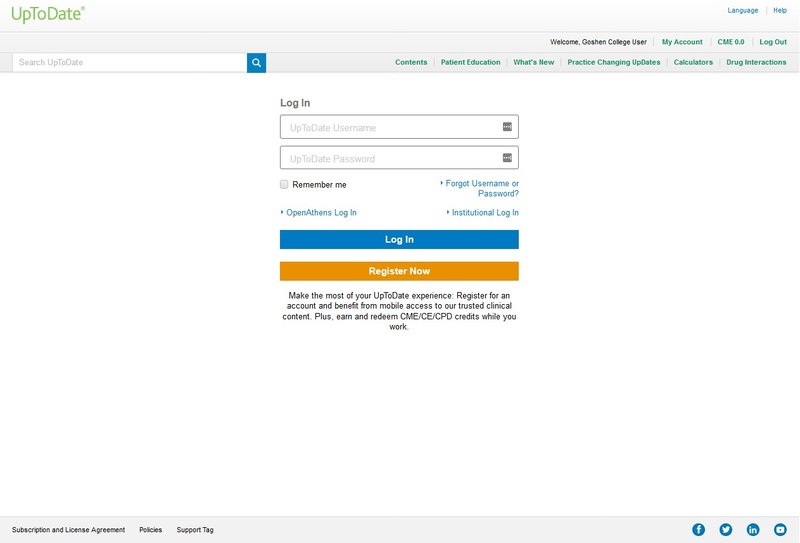 Once you have successfully signed-in, click on the Register Now button in the middle of the screen. Once you’ve created an account, log in with your created username and password. UptoDate may occasionally send you an email requesting that you verify your Goshen College affiliation. The email may imply that you need to be on the GC network. Don't Panic. You do not need to be on campus. To verify your Goshen College identity, simply access the web version of UptoDate using the links provided by the library. As long as you can access a web browser from your phone you can do this from your mobile device. 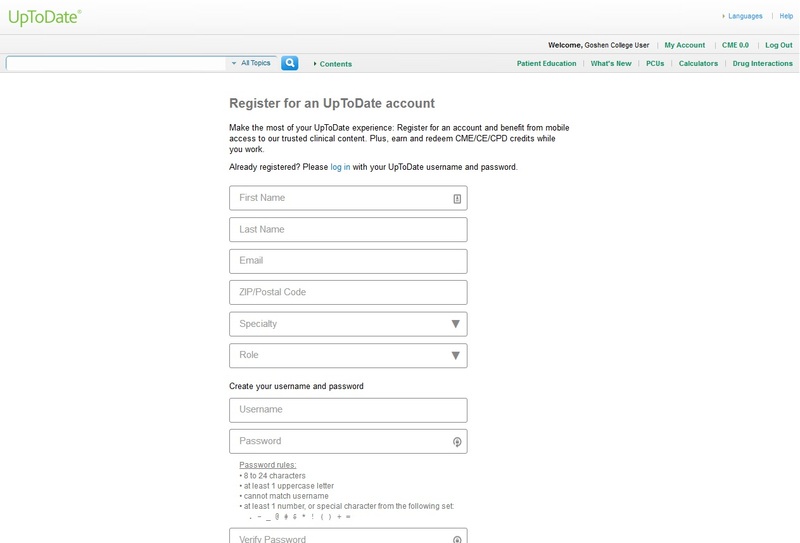 Next, log into your personal account with UptoDate (it must be this specific link, not simply www.uptodate.com). If you use the links on this guide you may be automatically logged into your personal account. If you see Goshen College, Click Log In / Register. If you see Goshen College User, Click Log In / Register. After you log into your personal account from the website, the app should refresh itself immediately. Please note: If you already have an existing account, do not register again, just login with your existing account. If you have forgotten your username or password, contact UpToDate support (800) 998 - 6374 OR customerservice@uptodate.com. Registering again will give you two accounts and this will most likely cause a problem. Are you having trouble logging into the app, even though you followed the directions on this guide? Try logging out and then logging in again. Try deleting the app and then logging in again.